120V systems: Up to 600ft of cable per thermostat. 240V systems: Up to 1200ft of cable per thermostat. A single 10ft long armored cold lead means no excess wires to run. Output as high as 12W per sq. ft (at 3” cable spacing - recommended). Heating cable is only ~1/8” thick. Can be installed together with HeatTech Mats. All thermostats and HeatTech floor heating cable are UL listed for USA. Ideal for: Bathrooms, Kitchens, Shower Beds, Saunas, etc. Well suited for new projects and renovation. Works with: Tile, Stone, Laminate, Granite, Vinyl, Engineered Wood Floors and others. Tutorials: How to size and select proper length of floor heating cable. X Electric radiant floor heating cable by HeatTech offers an easy, affordable and versatile solution for a wide range of project types. match the output requirements of the project. While 3” spacing is considered sufficient for a large majority of all installations, spacing the radiant heating cable closer (i.e. 2”) will increase the output of the system per square foot and may work better for very cold climates, areas with poor insulation or both. Likewise, spacing the cable at 4” will reduce the system output and may work best for warm climates, structures with very good insulation, or both. Installing HeatTech electric radiant floor heating cable generally involves more labor compared with HeatTech mats, but the overall process can be greatly simplified if installer is using HeatTech Cable Guides. Cable Guides are rolls of thin metallic strip with hooks for heating cable equally spaced at 1” apart. This spacing allows installer to secure the electric radiant floor heating cable precisely at 2”, 3” or 4” apart, ensuring the even heat distribution, and making Cable Guides a much better alternative to adhesive tape. (1) roll of specified length 120V heating cable. HeatTech 120V electric floor heating cable is available in many lengths to accommodate installation for most common floor sizes. Multiple lengths of cable can be combined to heat areas of up to 150 sq. ft (3” cable spacing) or up to 200 sq. ft (4” cable spacing) per single floor sensing thermostat. Detailed installation instructions included. (1) roll of specified 240V heating cable length. HeatTech 240V floor heating cable is available in various lengths, which can be combined to heat floor sizes up to 300 sq. ft (at 3" cable spacing - recommended) or up to 400 sq. ft (at 4" cable spacing) - using a single 240V, 15Amp thermostat. Installation manual included. Need additional thermostats, cable guides or floor sensors? See the list below. It may be necessary to use 2 or more runs of heating cable for a single zone (single thermostat) if the total length of cable required for the project exceeds 400ft (max. length available), but not exceeds 600ft (max length allowed per thermostat). Above only applies to large heated areas, typically over 100 sq. ft. Since a single floor sensing thermostat is capable of handling a maximum combined load of 15 Amps, the total combined Amp load (see tables above for data) of cables should not exceed 15A, which translates into 600ft of floor heating cable. For systems with 3” spacing, this equates into 150 sq. ft of heated space, whereas for 4” cable spacing – 200 sq. ft of heated space. 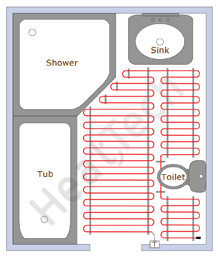 It is also possible to use a combination of electric radiant floor heating cable and mats, where mats cover the major square areas, while cable is laid out in areas containing angles, curves and small spaces. It’s Honeywell – all thermostat models available for sale are genuine Honeywell/Aube brand, a leader in thermostats and a #1 industry standard for quality, reliability and safety. Programmability – an important feature of the thermostat used for electric radiant floor heating is its’ ability to control the on/off cycling of the system at desired time. Efficient operation of the system may result in power savings in the 10-30% range compared to non-programmable thermostats. Floor sensing ability – for the proper operation and fast system response, a floor sensing thermostat is required. Regular (non - floor-sensing) thermostats are designed to sense the ambient temperature (room air temperature) instead of floor temperature and therefore will delay system start-up even if floors are cold and its’ shutdown even when the floors are warm. Built-in 5mA GFCI – since a Ground Fault Circuit Interrupter (GFCI) is required for safe operation of an electric radiant floor heating system, this thermostat safety feature is a must when thermostat is powered through a regular circuit breaker. In a traditional installation, floor sensor is installed in conduit piping rather then directly in thin set or mortar, and therefore can be removed and replaced in the unlikely event of failure. However, if floor heating system was not designed with such a conduit, it is highly recommended that a backup floor sensor is installed.